We are based in the Heart of Leicestershire, England one and a half miles from the historic Market Town of Melton Mowbray. Promoted as the “Rural Capital of Food”, Melton Mowbray is perhaps best known for its culinary specialities, being the home of the eponymous pork pie and one of the five homes of Stilton cheese. Melton Mowbray is bustling with activity on Tuesdays, when both street and cattle markets are held. Everything from clothing and household goods to fresh produce can be purchased. There is a large Saturday street market too, and on Wednesdays a small antique/bric-a-brac market takes place in the town centre. Melton Country Market takes place every Friday from 9am – 2pm, at the Cattle Market with a range of naturally reared meats, organic vegetables, bread and locally made cakes, preserves and honey. Sunday is the day for car boot sales with around 50 vehicles and 1000 visitors at the Cattle Market. There are many Towns and Villages of interest in the area along with Rutland Water, Stamford, Nottingham, Leicester, National Space Centre, Belvoir Castle, Twin Lakes for the children and much more. With many village pubs with excellent dinning facilities. 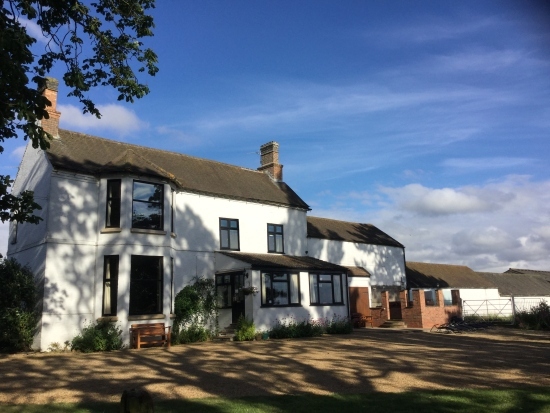 The Farm House and Cottage are provided with a few little essentials including a welcome pack of milk, tea, coffee, sugar and fresh flowers also toiletries. All you need to bring is food, drink and coal for the BBQ or make a selection from Melton Mowbray’s excellent local take-away’s and yes they deliver. 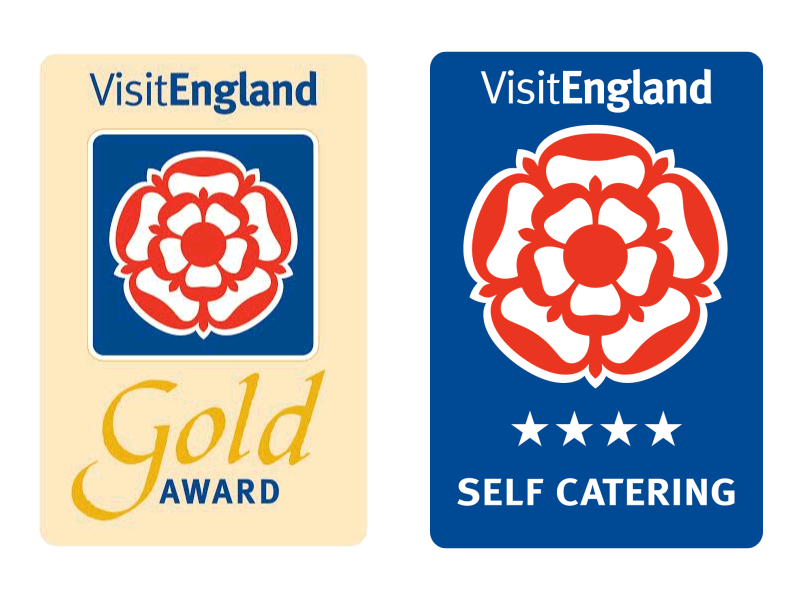 Both properties at Old Guadaloupe have been assessed by Quality in Tourism with the Farm House holding a 4 Star Gold Award whilst the Cottage has a 4 Star rating. Our 500 Year Old Farm House is on a working farm with lovely views over the Leicestershire countryside. There are three spacious bedrooms all with en-suite bathrooms and Flat Screen T.V’s with DVD, one Super King, one King Size and one Twin. The lounge has a flat screen T.V. & DVD player. Also available is a games room with a pool table. The kitchen has every thing you need with it’s Rangemaster cooker, Smeg Fridge and Microwave also utility room with a freezer, washing, drying machine and iron with board. 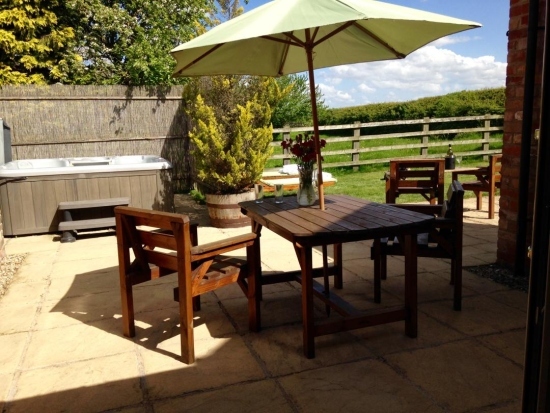 Relax in the conservatory and then go to the very large private and secluded hot tub and take in the peace and quiet on the patio with sun loungers, BBQ and picnic table surrounded by two large lawned gardens and spacious parking area. All with central heating. Our beautiful spacious Old Guadaloupe Cottage with its original beams has a King Size bed, remote controlled ceiling fan, TV/DVD player, iron and board. The bathroom has a large shower. In the lounge there is a dining table, Radio/CD, Sky TV & DVD player. The kitchen includes a fridge and freezer, oven/hob, dishwasher, washer/dryer, microwave. All with central heating. 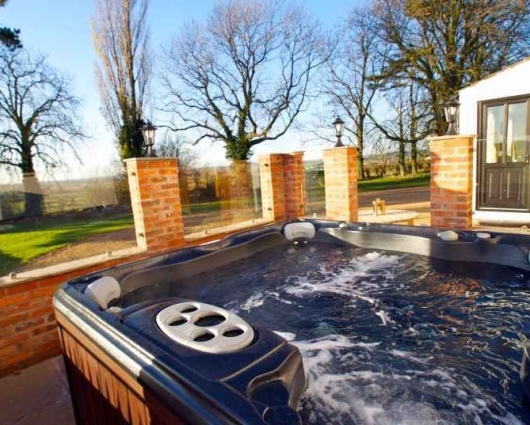 Outside is a large relaxing hot tub on the patio with table, chairs, sun loungers and BBQ with it’s own lawned area and plenty of room to park.